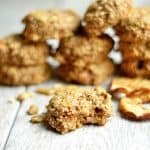 Healthy Carrot Cake Breakfast Cookies are refined sugar-free, gluten-free, and full of nutrient dense ingredients! 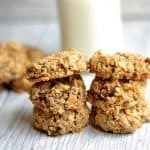 Tasting just like a piece of carrot cake, these cookies are sure to be a hit with everyone in the family! You guys, I am so excited about this recipe. My 8 year old made these from start to finish, and I am letting her take over this blog post! Hi my name is Addy! I am 8 years old and I like to cook, read, and dance. I also like candy and junk food, but my mom does not let me eat as much as I want! That is why I made this recipe. 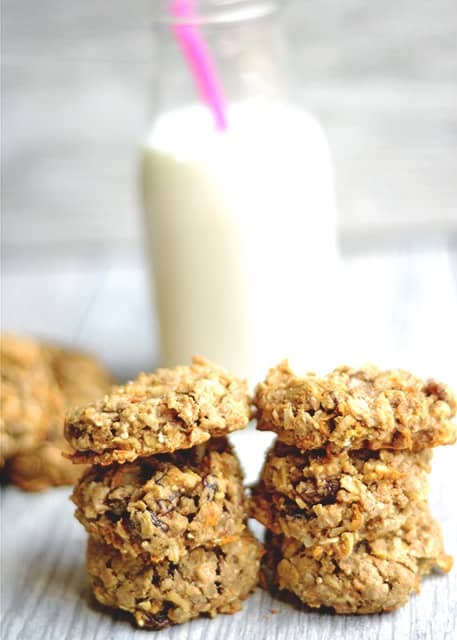 It is a carrot cake breakfast cookie recipe and I made it because I like breakfast and carrots! After I made them, I asked my brother what he thought and he said it was a great idea and he couldn’t wait to eat them again. He even said he wanted 8 for breakfast he liked them so much! I liked it probably the same amount he did, maybe even more! I liked them because I thought the raisins and carrots mixed together nicely and I liked that it was sweet, but healthy! I also shared these cookies with my neighbors Lillie and Lola. They told me they were so good even though they don’t like raisins that much. I think they go perfect with a glass of milk! We’ve been packing these in our lunchbox this week and eating them for breakfast. They make a great after school snack too! I hope you like them as much as we do! My mom is back to write up the recipe. 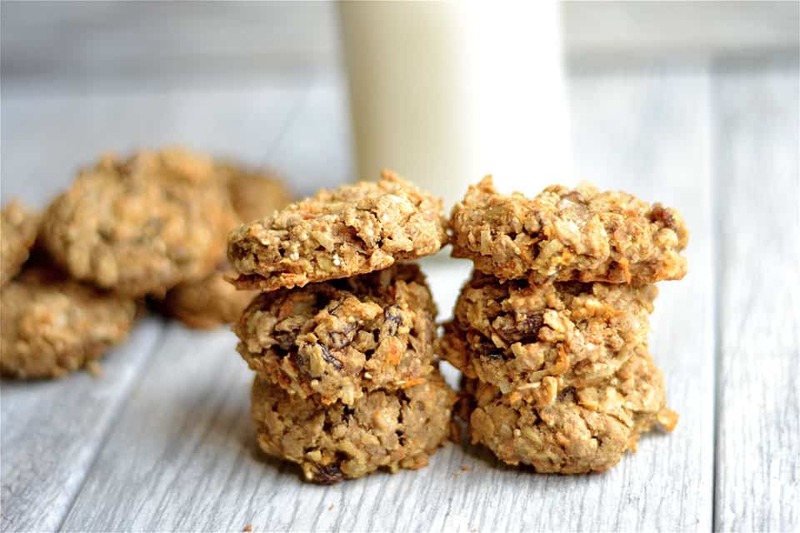 These yummy carrot cake cookies are perfect to let kids get involved with baking/cooking. 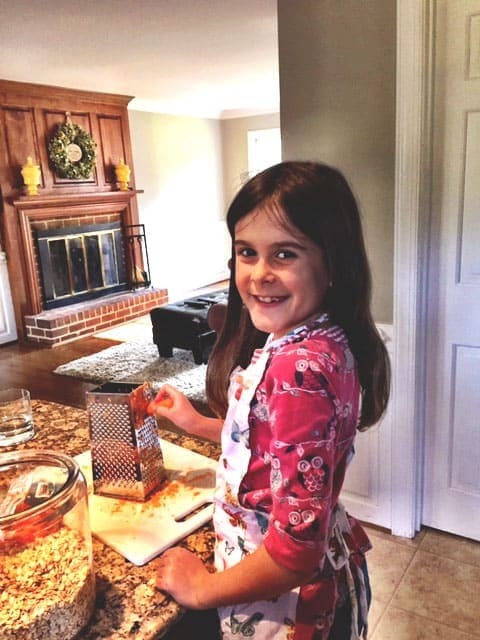 I wrote the recipe for my 8 year old, and let her do everything by herself. Preheat your oven to 350 degrees. Lightly grease a cookie sheet and set aside. 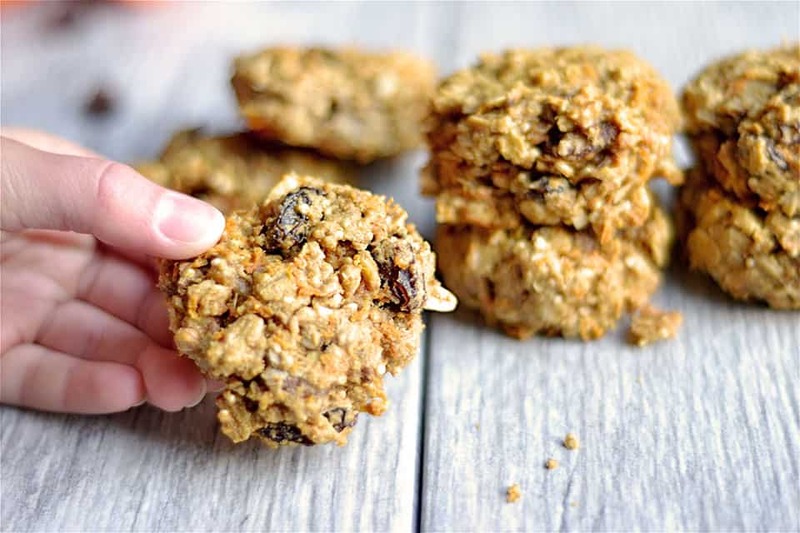 In a large bowl, mix together flour, oats, quinoa seeds, baking soda, salt, and cinnamon. 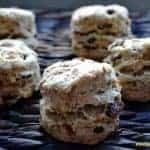 Add raisins, coconut, and walnuts. Set aside. In a medium sized bowl, mix together coconut oil, vanilla extract, and honey. Add eggs and whisk to combine. Slowly fold wet ingredients into dry. 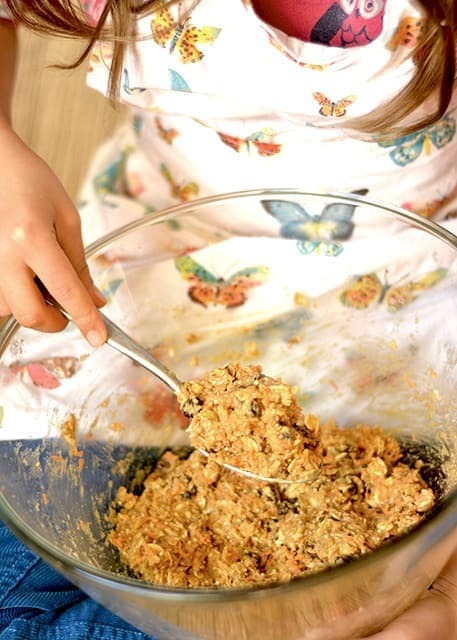 Continue to mix with a large spoon, until dry ingredients are completely mixed with wet (no dry ingredient clumps). Dough will be thick. Using an 2-inch diameter ice cream scoop or large spoon (about 2 tbsp of dough), scoop dough onto a cookie sheet about an inch apart. Gently press to slightly flatten each cookie. Bake for 12-15 minutes, or until cookies are golden brown, firm to the touch, and soft on the inside. Remove from oven and let sit on baking sheet for another 5 minutes. Remove from the pan and let cookies cool completely. Cookies can be stored in an air tight container at room temperature for up to 4 days. These look wonderful Addy! I saw them on foodgawker and had to come and see the recipe. They look healthy and delicious so I am pinning them for later! Great job Addy. I like breakfast and carrots, too. I can’t wait to make these for Easter. carrot cake in cookie form for breakfast? YES PLEASE! These look delish! Haha!! That’s how we like it in our house too 🙂 Thank you!! There is no Carrots in the directions…. I pinned this recipe for later and am just going to make them. I am kind of new to quinoa and just wondering if you cooked it first? Did you use liquid or raw honey? I have a great cinnamon honey that I would love to try in this recipe. Thanks so much. Hi Glenda, I used raw Quinoa so it has the texture of seeds. 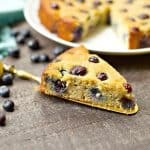 You can also use chia seeds in it’s place. I use raw honey, but the cinnamon honey sounds delicious! hints you are writing at this site. My prolonged internet research has finally been recognized with reliable information to write about with my two friends. reading here. Thank you once more for all the details. Would it be okay to omit the quinoa? Morning, my husband and I are ready to make the cookies and we can’t find out where to add the shredded carrots. We think the carrots would go in with the “wet” ingredients. Yes, with wet ingredients! I will change to make it more clear. Hope you enjoy!